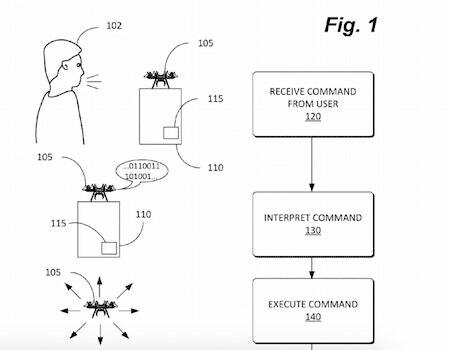 How Can Amazon Patent A Voice-Controlled Drone? A voice-controlled drone - that's what we need, says Amazon. And in a patent application published by the US Patent and Trademark Office, they detail one. Amazon has no small ambitions for these UAVs. The company says in the patent filing that these itty-bitty drones could be used to support police during traffic stops; to help find a kid in a crowd; or to clear tunnels during a military maneuver. All of these activities would be enabled with a combination of advanced voice controls and more direct remote controls provided by a companion app for smartphones and tablets. He set his camera to follow him, and it hovered behind him like a large tame bee. "Tight mid-shot and pull out on but behind me," he told it. He checked the shot on his handheld screen and moved a few meters to the right. That was better.